With a buttery crust, thick apple pie filling and crispy crumb topping these Apple Pie Crumble Bars are a fall dessert that is hard to resist. I don’t know if you remember my Apple Cinnamon Blondies from last year, but they were one of my favorite fall treats. They were a part of Rachel’s An Apple a Day series. Well, this year she is hosting again and of course I had to bring my A-game! So far over there you can find Apple and Salted Caramel Ice Cream (drool), Caramelized Apple & Cheddar Cheese Soft Pretzels (What?! ), and Apple Cider Donuts (three ways!) among other things. I actually baked these Apple Pie Crumble Bars a few weeks ago, before apple season had really even started. I wanted an apple dessert that I could bake ahead of time for Rosh Hashanah and that would travel well. They were a huge hit for the holiday, though I imagine they would have been an even bigger hit warmed up and smothered with ice cream… next time, next time. 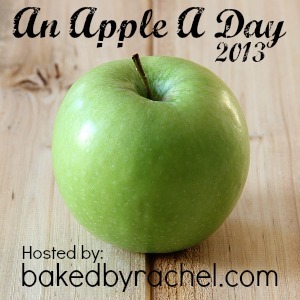 Be sure to head over to Baked by Rachel for the Apple Pie Crumble Bar recipe! Hooray! I love the apple a day series! I am definitely in apple baking mode. Not sure I have the energy for a full-on pie just yet, but bars I can handle! Off to check these out! I love crumble bars, and these look like the perfect bars for fall! These are the kind of bars I love because that crunch from the oat crumble just adds the right amount of texture. Anything with crumble is a hit with me… but add apple?? And it’s something I don’t think I’d share!!! LOVE!! !